My new favorite chicken tacos!!!!!!!!! These tacos have a slight kick, so if you don’t like spice reduce the chili powder. I prefer to cook boneless chicken in a crockpot on HIGH for 2 hours, but you can always lengthen the cooking time and cook on low (the usual cooking time conversion is when you cook on low you double the high cooking time, so in this case it would be low for 4 hours). The original recipe call for cooking on low for 6-8 hours. Toppings: Salsa, tomatoes, sour cream, cheese, etc. In a bowl mix the orange juice, lime juice, garlic, chili powder, cumin, oregano, salt and pepper together and then pour over chicken. Cook on HIGH for 2 hours or until tender. 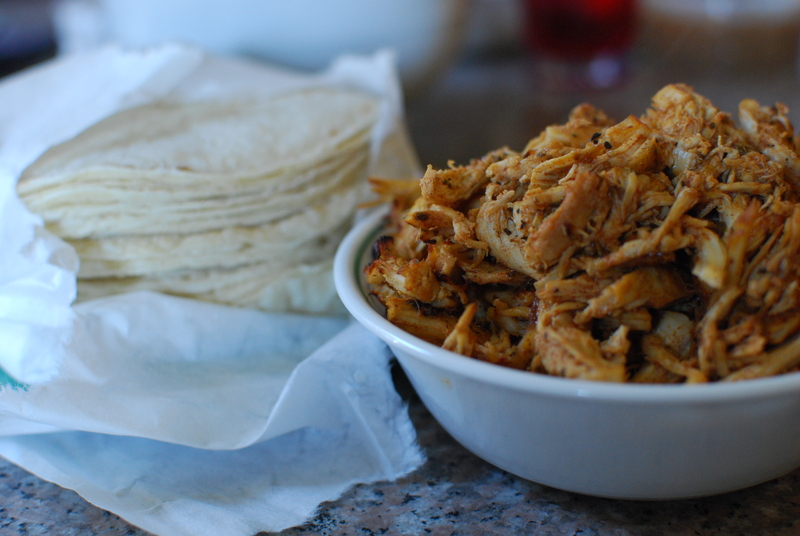 Remove chicken from crockpot and shred. Reserve the juices. Spread the chicken out in a single layer on a baking sheet and add 1/4 c. of juices and broil until it starts getting crispy, about 5 minutes. Mix in another 1/4 c. of the juices, mix everything up and broil for another 5 minutes. Remove from oven and mix in another 1/4 c. of the juices. Assemble the tacos on the tortillas with the chicken carnitas along with the cilantro salsa and whatever toppings you like and serve with the lime wedges.